I thought I should discuss with you all my final carbon star in Andromeda on the Double Star Forum as it is positioned about 45 arc seconds from a yellow star TYC 3303-1008 which has a magnitude of 10.8. It was Eric (Cildarith) who was the original individual who gave me the challenge of observing an additional 18 carbon stars after I had observed 8 easy carbons 2 years ago. So having successfully observed 25 of the 26, I set out to find Case 717 which also has the designation C* 108. On my Guide 9.1 DVD the 26st carbon star ought to have a non varying magnitude of 11.7. On that DVD the carbon star has the rather awkward designation 3UC279-040586. I won't be using that title on this occasion. It will probably be no help to anybody. Also I was able to split the nearby double star ES 458 in Andromeda at 112X, 140X and 167X which was an enormous help to finding the yellow star TYC 3303-1008. ES 458's separation is 5" with a PA of 316 degrees. The magnitudes are 10.2 and 11.0. Now let me discuss Case 717. You would think that if its magnitude is 11.7 I should be capable to see it at 167X. But no! There was no sighting of it. Precisely 1 week ago on the 1st February 2019 I went up to higher magnitudes -225X and 280X but still no carbon. Finally out came my Nagler 3.5 mm eyepiece on that night which gives 320X. (It was a pristine night with no Moon) and I reckon I could see a dim orange star. But that was by using averted vision only. By my reckoning Case 717 or C* 108 might be as dim as magnitude 13.0 right now. One of my friends checked the star on Sky Safari. It states Case 717 ought to have a magnitude of 10.2. But that clearly is wrong. However it also states that the star has another designation: V0762 Andromedae. So maybe it is a variable star after all. However I have since gone to www.aavso.org where V0762 And is not considered a variable star. 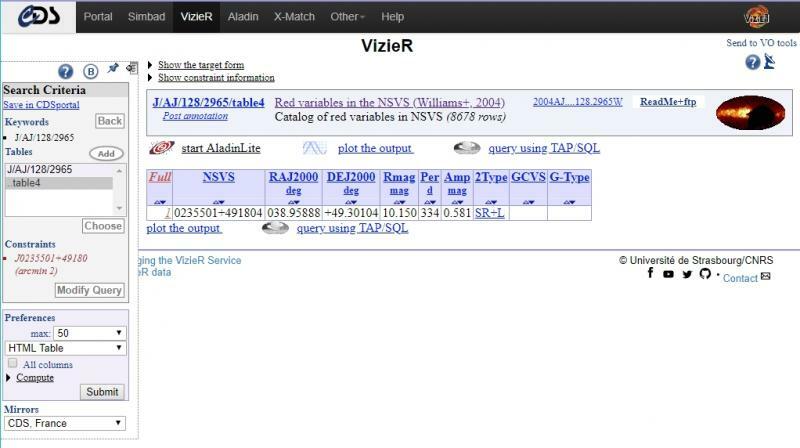 www.aavso.org have given it their own designation: 000-BMZ-062. They also give an estimated magnitude of 10.2. So let me give the star to you guys on the Double Star Forum. I realise it might be quite a number of days to offer an explanation. There is no need to rush in with your opinions. I will also welcome images or diagrams of any kind. I'm sorry about all the designations -but I thought I ought to give as much information as is possible. Edited by flt158, 08 February 2019 - 11:22 AM. Aubrey, a very useful thing would be to give the RA and Dec of the carbon star - I looked it up via Simbad, and the J2000 coordinates are 02h 35m 51.5s +49 18 02 . Obviously, the position needs to be precessed to early 2019, but that won't be a huge change. From a check on precession change via Cartes du Ciel, the precessed position for our current date would be (based on the precession of nearby TYC 3303-1008-1) 02h 37m 09s and +49 22 58. 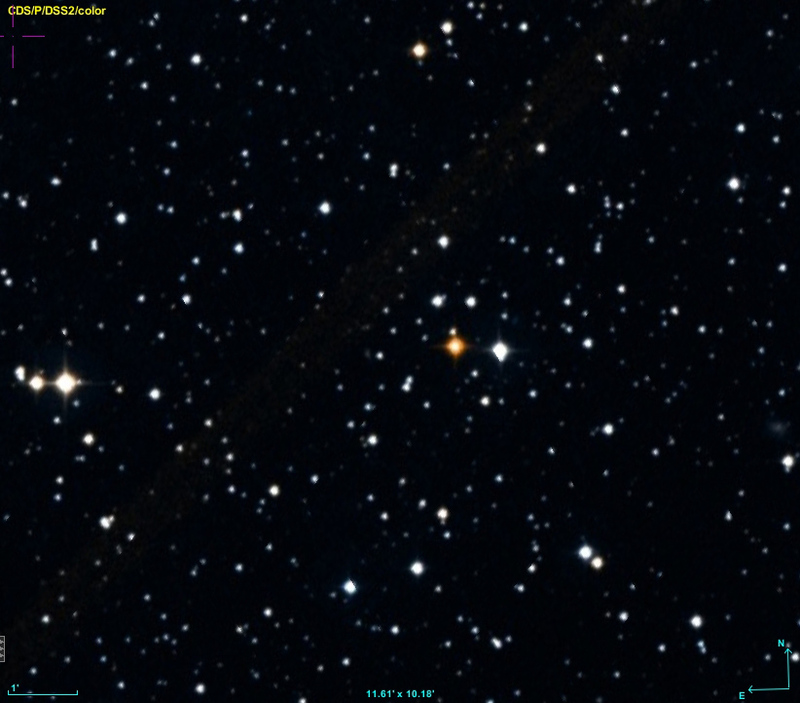 It shows nicely on the AladinLite image from DSS, not far from the TYC 3303-1008-1 star you mention, that's listed at visual magnitude 10.8 and looks roughly similar in brightness to the carbon star though very different in colour. And the human eye is less sensitive to red than white or yellow. 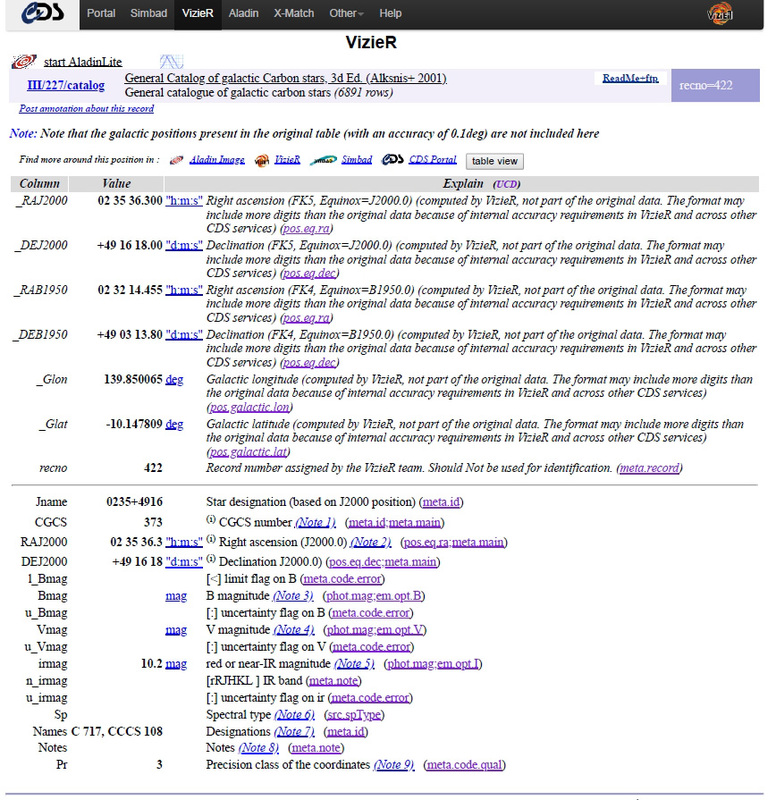 The data listing in Simbad for the carbon star does not include a V (visual) magnitude. There is an estimated 11.5 in B (blue), perhaps optimistic given the extreme redness. A G-magnitude (Gaia) is 11.05, but Gaia tends to give somewhat brighter numbers for G than V; and the eye sensitivity factor matters as well. So the Guide 9.1 listing of 11.7 may be fairly close... but at that dimness, you won't see much colour even if you pick up the star: it'll likely look dull/darkish tone, unless you have the enhanced red vision that the Herschels appear to have had. Incidentally, for those who like fainter doubles, as well as ES 458 being nearby, ES 459 (3", m10.0 and 10.3) is in the same small area, a little way East and just North from the carbon star. It is always good to hear from you, Fred. I should also have stated my scope is the usual William Optics 158 mm triplet apochromatic refractor. Thank you for providing the latest RA and Dec coordinates for Case 717 via Cartes du Ciel. Having experienced other orange / red carbon stars which were fainter I thought it would be possible to see Case 717 with my set-up. Let me list 4 of them I have recently found through my eyepieces. My 225X and 320X eyepieces are both Naglers. The 167X is a Meade 6.7 mm with 7 elements. The 280X is a William Optics 4 mm. 1. Tyc 3636 1782 had a magnitude of 11.4. Its colour was red. Observed at 167X and 225X. 2. 3UC280-021968 is not a carbon star although it is red and has a magnitude of 11.7 which is precisely the same as Case 717. We discussed the former because it is 10" away from the carbon star NC 4 only last October. It looked good at 225X and 280X clearly separated from NC 4. 3. Tyc 2798-319-1 is a carbon star of 12.1 magnitude. Observed its orange hue at 167X. 4. C* 3227 is a red carbon star of 12.5 magnitude. Observed at 225X and 280X. Therefore I ought to see Case 717 unless it is fainter than 13.0 magnitude. Let us see what others find out about this enigma. I thank you, Fred, for your expertise on the matter. 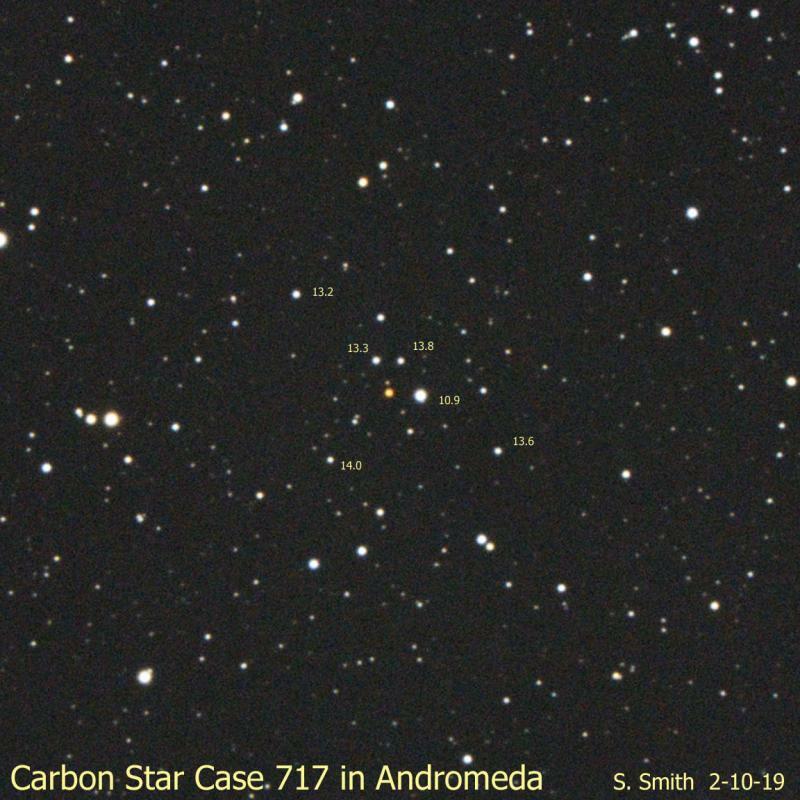 Simbad does indeed show the carbon star Case 717. I have just seen the AladinLite image. I guess I'll have to try to observe it again. 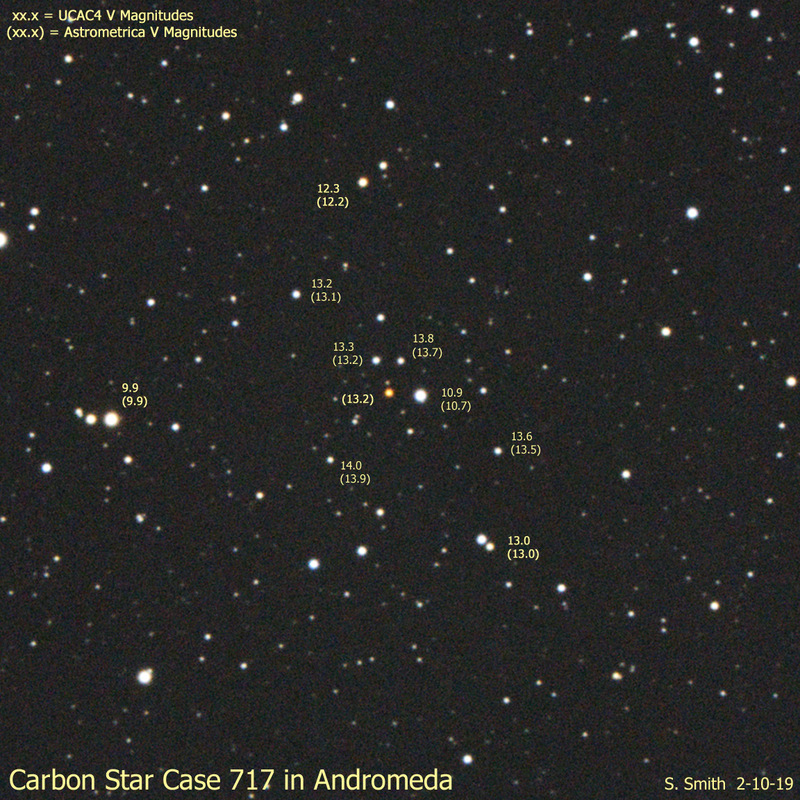 Still - having observed 25 out of 26 carbon stars within Andromeda's boundaries isn't too bad. Based on the attached Simbad data the 10.2 magnitude is an IR magnitude. I attempted to do a J-K magnitude conversion which gives a 12.5 V magnitude value. This value may not be totally accurate since the (J-K) value is slghtly out of range for the equation used, but it does illustrate that the object is much fainter than you expected and most likely near the limit of your optics. Conditions look promising for tonite and I will try to get some photos. Edited by ssmith, 10 February 2019 - 02:28 PM. Was able to get some pictures tonite - here is my result and a comparison picture from ALADIN. In my photo Case 717 appears slightly dimmer than in the DSS photo. Based on the UCAC4 magnitudes I placed on my photo the carbon star is perhaps magnitude 13.3 or even dimmer visually. I will try to do some more rigorous photometry in the next few days but coming up with accurate visual magnitudes for red stars without the use of multiple color filters is notoriously difficult. Edited by ssmith, 11 February 2019 - 12:19 AM. Thank you ever so much, Steve, for providing these brilliant images to us all. Please do come back to us once you have been successful with your rigorous photometry and do use as many filters as you require, Steve. Eventually I hope you will be 100% successful in figuring out the visual magnitude of Case 717. I now believe that I did observe Case 717 on the night of 1st February with my William Optics 158 mm apochromatic refractor. As I pointed out before on my original post the evening was pristine clear. I was granted excellent conditions to push up my magnification up to 320X with a Nagler 3.5 mm (I had no shimmering). Case 717 would not show itself at any lower power. I could see an extremely faint orange star by only using averted vision. Clearly visible was Tyc 3303-1008 which is in your images shining at 10.9. Also seen was the very faint 13.3 magnitude star to the north of Case 717 -but with only inverted vision again. Your 2 images above have given me great confidence that I did indeed observe my faintest carbon star ever!! And I would completely concur with you, Steve, that Case 717 is considerably fainter than +13.0. Now my only question is if it could be a variable star. Originally my challenger, Eric (Cildarith) thought it would be brighter than magnitude +12.0. Guide 9.1 gives an estimate of 11.7. Next autumn will probably be the next occasion to check that. But I will keep you all posted in the meantime if I observe it again over the next month or so. Needless to say, I am celebrating wildly as a result!! I am even thinking that Case 717 has given me more pleasure than the Total Lunar Eclipse of 21st January 2019. Observational astronomy can sometimes give us big (and tiny) surprises. Any further comments from anybody will be received by me with great pleasure. I do not have a set of photometric filters which are very expensive so I don’t plan on doing any fancy photometry on this one. I did run my photo through Astrometrica which will calculate magnitudes based on comparisons to the surrounding stars in the frame. It located 181 reference stars in the frame. I have added the Astrometrica derived magnitudes (in parenthesis) next to the UCAC4 magnitudes I had shown earlier. The Astrometrica V mag value for Case 717 is 13.2. Looking at the values shows the Astrometrica magnitudes to be about 0.1 magnitude brighter than the corresponding UCAC4 value. If we add 0.1 mag to the Astrometrica value of 13.2 we get Vmag = 13.3 which is about what I estimated in my previous post. Edited by ssmith, 12 February 2019 - 11:03 AM. Oh yes -I remember hearing that before -regarding the cost of expensive photometric filters, Steve. Why would anyone spend so much on these? However I am having a very busy week. And Irish skies are overcast anyway. I'm happy to wait a while to see if Case 717 does brighten. Perhaps there would be others who would give our carbon star a quick glance. Thank you again for all the time you have put in on this project. I'm delighted to state I have observed all 26 carbon stars in Andromeda that Eric (Cildarith) has compiled for me 2 years ago. Case 717 has a period of 334 days but the magnitude change is only 0.58 magnitude. It is not a lot but perhaps more noticeable on something this faint - perhaps the difference between seeing it and not seeing it. Edited by ssmith, 13 February 2019 - 12:19 AM. Thank you for your knowledge, Steve. Did you get that period and variability from Simbad or from some other source? Can I ask one final question regarding this carbon star? Is the designation "Case" named after someone? It would be nice to know as I am sharing this particular experience with friends. One of the earliest catalogs of carbon stars was the "General Catalogue of Galactic Cool Carbon Stars" compiled by C.B Stephenson at the Warner and Swasey Observatory, Case Western Reserve University in Ohio. You have been a tremendous encouragement to me over these last few weeks!